When we bought our house in 2003, the kitchen was terrible (think avocado counters, not of the charming retro variety), This was exciting to me for one reason: In a few years, when we could maybe afford to renovate, we could create the perfect family kitchen from scratch. Of course, as anyone who has lived through a renovation can attest, “perfect” means one thing to someone and another thing altogether to that someone’s spouse. (A story which deserves another post/Lifetime drama all its own.) 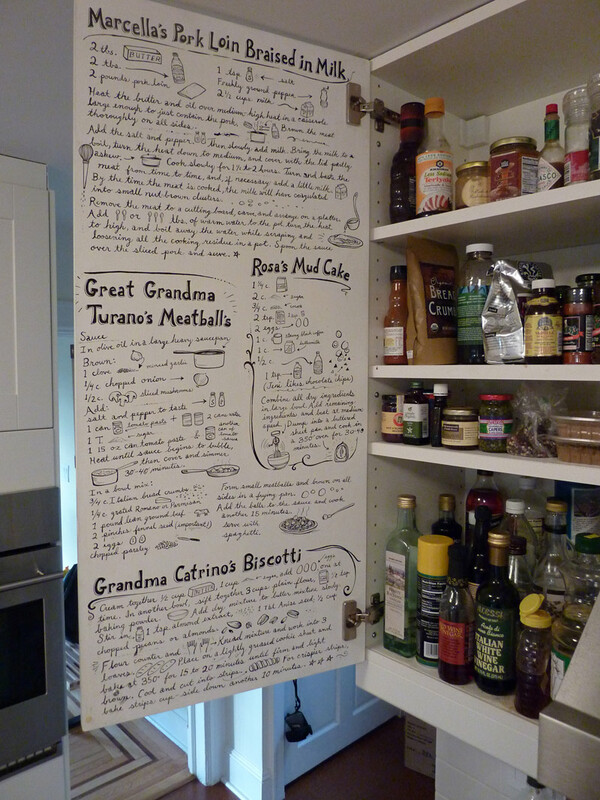 But the idea to have an illustrator (the amazing Gina Triplett) paint recipes on the inside of an upper cabinet door was universally loved by all the decision-makers in the house, especially the kids. The only tricky part was figuring out which recipes were deserving of such an honor. Ultimately, to qualify for “cabinet door” treatment, we decided the recipe needed to be both steeped in family history and, of course, be delicious. The line-up: One recipe from each of our grandmothers (Grandma Catrino’s biscotti, Great Grandma Turano’s meatballs) “Rosa’s “mud cake , which my best friend’s mom served at every one of my best friend’s birthday parties when I was little, and Marcella Hazan’s milk-braised pork, which Aunt Patty made the first time I met my husband’s family in 1992. Now we have a private living memorial to those who have influenced me in the kitchen, and my kids will grow up with a certain reverence for these dishes. Guess that means I’m never moving. The How-To: Triplett started by giving the door a coat of paint similar to the outside color. (This allowed her to paint over any mistakes she made along the way.) She then sketched out the words in pencil and went over them using a superfine paintbrush dipped in black paint. Are you kidding? That’s the whole point. Steal away! Love this! I have things taped inside, not painted, but the idea has got me thinking. Another idea… your commonly used cabinet (you know… the one by the phone…) could have important phone numbers illustrated, like the babysitter, emergency numbers, grandma/grandpa, etc. Dunno if my husband will go for it, but I’ll try. Thanks! that’s a nice idea, lisa! When I saw this I thought of my Mom! She always pasted her favorite recipes on the inside of her cabinets, she would cut out the recipe and then place it over a piece of decorative paper or doily and then paste it to the inside of the cabinet. It was decorative and utilitarian! That is possibly the coolest kitchen renovation I have ever seen. Amazing. And the artist did a great job, too! That is so way cool. I’ve never seen that before. 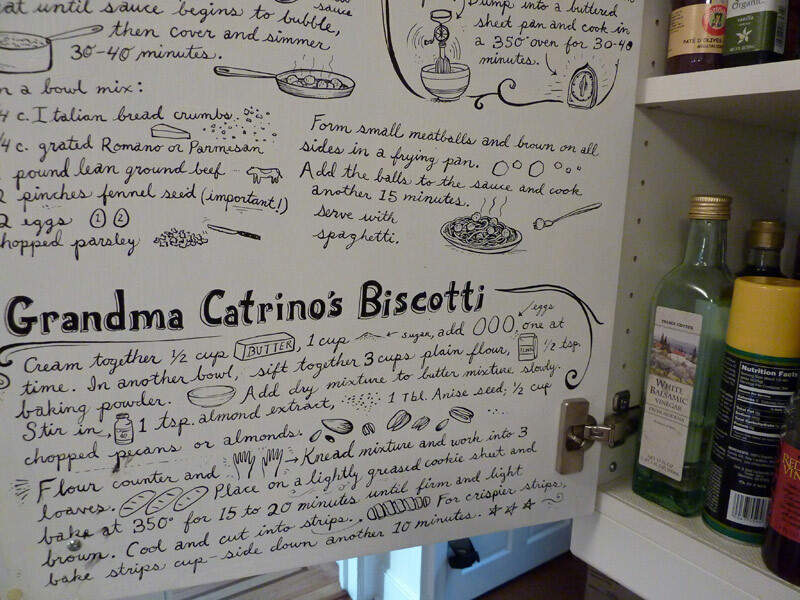 On my doors I’d put my recipes for brownies, banana split cake and minestrone! That’s beautiful enough (both the idea and the implementation) for the outside of the cabinets. What a great idea to keep family heirlooms around for everyone to enjoy. I love seeing recipes out in the open.. i think it’d be neat to do this will a removable type marker on the outside so you could change them every so often. Very cool! conversion chart for measurements would be another great one perhaps? I absolutely love this idea, I was searching for wallpaper with recipes on it, or take a cookbook and paste the recipes to the wall, but this is much easier and beautiful.